Do you want the good news or the bad news? Bad first? Okay: even if we beat Bayern over two legs, we almost certainly won’t win the Champions League. 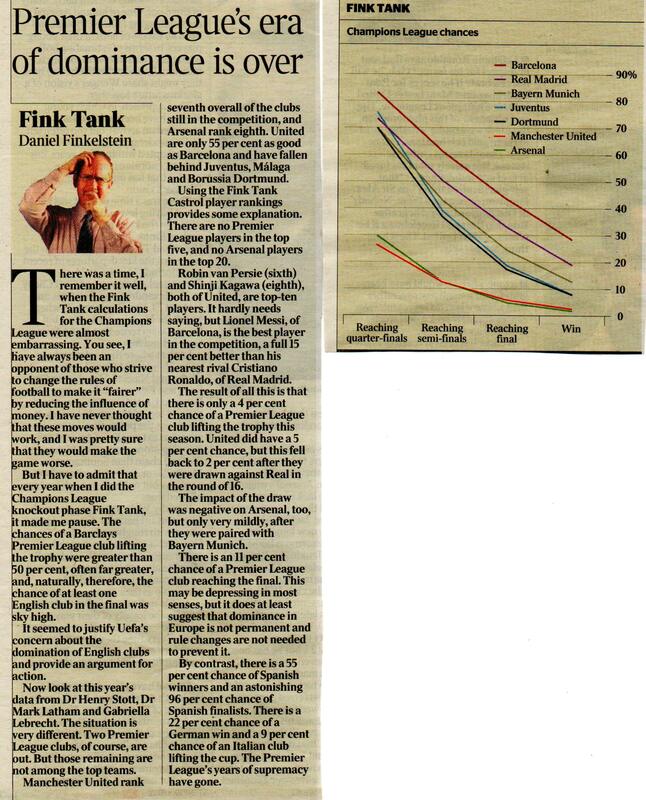 In fact, according to the odds calculated by Daniel Finkelstein’s boffins for The Times, Arsenal have about a 30 per cent chance of reaching the last eight, 13 per cent chance of reaching the semis, five per cent chance of reaching the final and two per cent chance of winning it. Man Utd’s chances aren’t much better – or at least they weren’t when these odds were calculated, which was before they got a reasonable result in Madrid in the first leg. Probably they now have a slightly better chance. Regular readers of this blog will know I don’t always set much store by statistics in football (“Except when it backs up your point” – © @7amkickoff), and to be honest I’m not convinced by some of the justification for these odds. They back it up using the Castrol Rankings for players, where at the time of writing Arsenal had no players in Europe’s top 20 (currently none in the top 50! ), while Man Utd had two in the top ten: Robin van Persie and Shinji Kagawa. Has Kagawa been that good this season? Can’t say I’d noticed. Utd currently have RvP at 4, Rooney at 7, and Kagawa has dropped to 28. But the Castrol Rankings can look a bit odd. 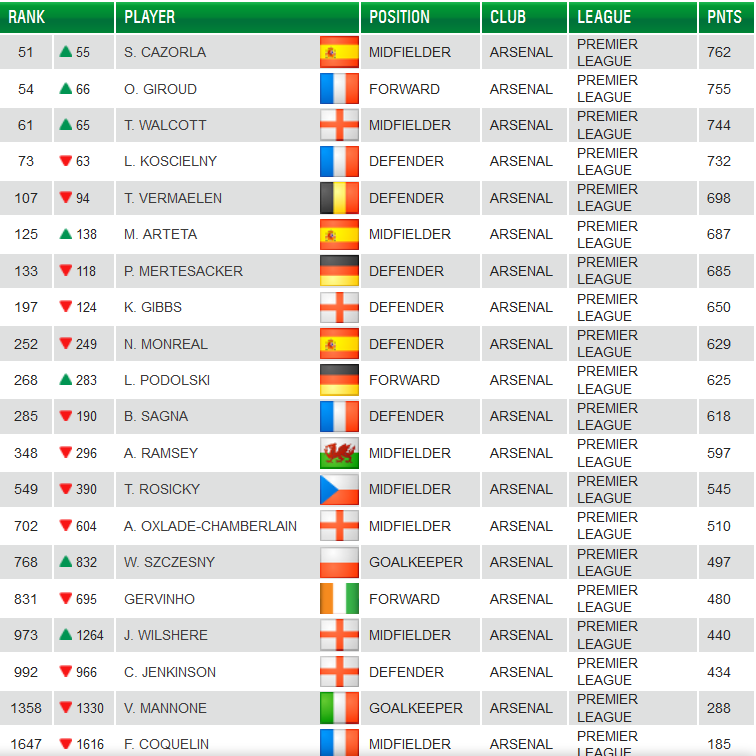 Look at where the Arsenal players are: Koscielny is the 73rd best player in Europe! Wilshere is below Gervinho! Okay, those two are moving in opposite directions, but I think these rankings take a while to catch up with reality, if they ever really do, and by then reality may have changed again. Anyway, you’ll want to be about your business I’m sure. In summary: I’m ever hopeful (before games start) that Arsenal will do whatever needs to be done. Just not particularly hopeful of winning the Champions League this season, whatever happens against Bayern. Oh yeah, the good news: whoever we lose to in the CL (assuming it’s not the one season in 50 the odds say we’ll win it), it won’t be as embarrassing as losing to either Bradford or Blackburn in the other cups. I think that a win is on the cards tonight and an inspired performance which will leave us all wondering – Why can’t they play this way every game? The data on Gervinho/Wilshere should underline the fact that the media jumps on wild tracks and the public follows too easily. Gervinho was having actually surprisingly decent productivity for a while at center forward before he hit a bad patch. And in any case he is the kind of player that can score goals & create assists in the same game where he does some crazy tings you dont know why. But it doesnt mean he wasnt productive. The fans should stop following the press like blind sheep and get behind this guy. He is one fo the few players we have who can break down a packed defense with the ball at his feet. Much better than Walcott, AOC and Podolski on that front And that is what we face increasingly often. The fans would be smarter to help build up the guy’s confidence instead of trying to break him down. But oh wait we are talking about the same fans that hounded an honest, flexible and hardworking pro out of town before: Eboue. No surprise then. Overall the article is interesting. It should also underline that the real problem is not Wenger – it is that he working with a restricted budget and no longer able to afford the very best players. No wonder he was going to make Van Persie play out the contract. Would have been an interesting gamble.